Kanchanaburi is a small, historical town that’s popular for day trips from Bangkok. As it’s only a two hour drive, many tourists come to see the famous bridge over the River Kwai and take the train through Hellfire Pass. 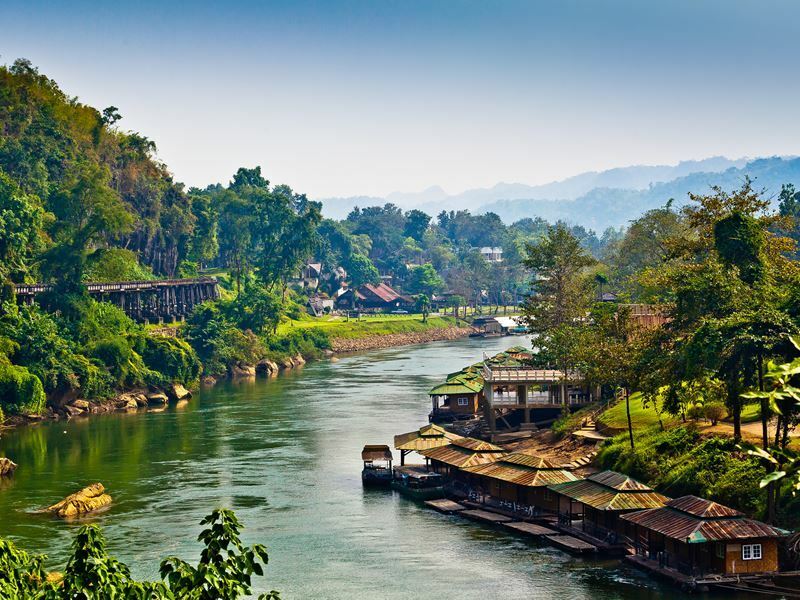 The town itself is framed by rolling mountains and many riverside restaurants and bars offer a relaxed feeling, especially compared to Bangkok. Those who enjoy learning about the past will find the museums and history of this border province informative and educational. 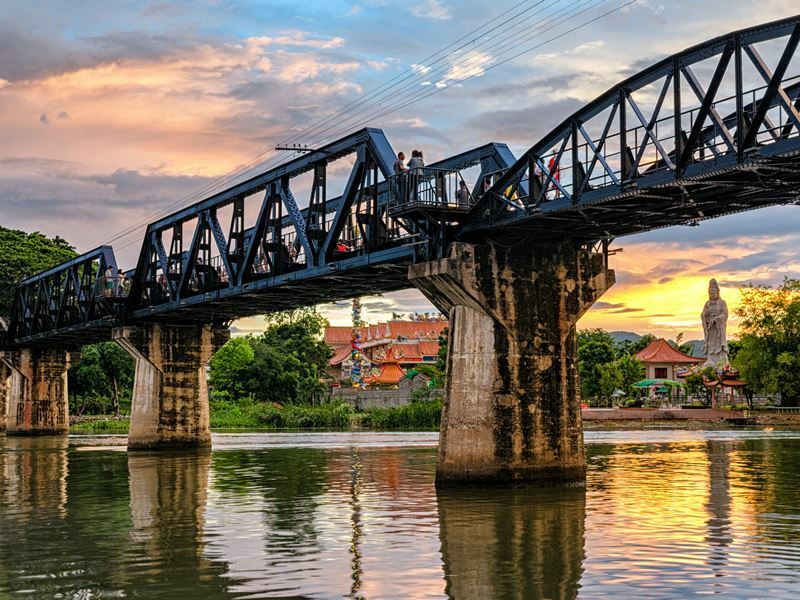 The iron railway bridge resting over the River Kwai in Kanchanaburi was made famous the world over in 1957 when the 'The Bridge on the River Kwai' was released, and more recently by the 2013 screen adaption of 'The Railway Man'. The original, two and a half hour film depicted British soldiers during World War Two taken captive by the Japanese, and their struggle to build a bridge for the Burma-Siam ‘Death’ Railway. While at first they are reluctant, the bridge later becomes a monument to British character, morale and dignity despite being prisoners of war. The real plot twist is while the prisoners are building this bridge, the Allies are leading a team into the jungle to blow the bridge up. The film won countless awards for its complex messages and show of spirit in the face of adversary. From seven Oscars and three British Academy Film Awards, to three Golden Globes and even a Grammy for the soundtrack, the film is hailed as one of the best war sagas in history. The film was based on a French book by Pierre Boulle, published in 1952 and translated into English in 1954. While the original won the coveted Prix Sainte-Beuve prize in France, the books only became really popular after the film was released and these days can be found in all major bookshops across Thailand. The story is fictional but based around the real construction of the Burma Railway by the Japanese, and Boulle drew much inspiration from his own experience working with Allied forces in Indochina. The bridge that draws thousands of tourists to Kanchanaburi every year is not actually the bridge from the film (movie buffs will undoubtedly be aware that the film was actually made in Sri Lanka), or from the history books. Thailand faced a problem when tourists started turning up looking for the bridge in question. The original was bombed and a wooden one erected upstream and deep in the jungle. 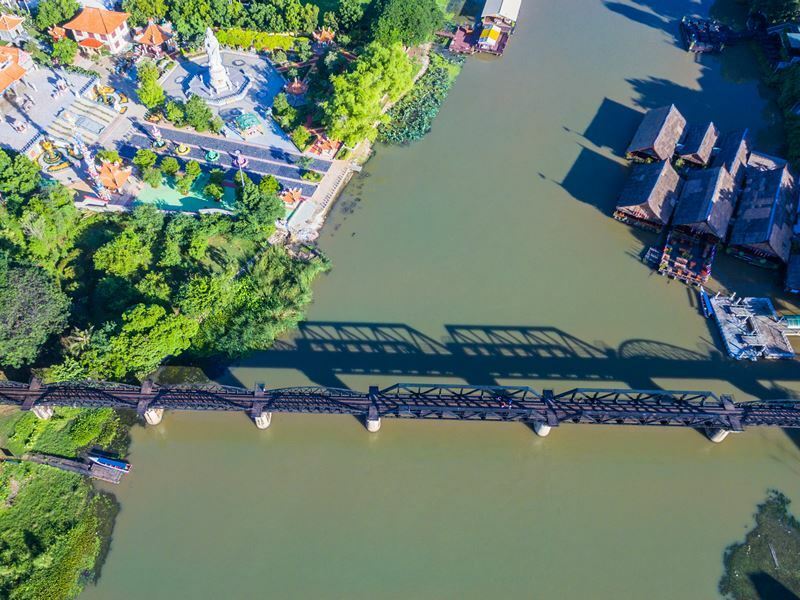 There was a second bridge, about 100 metres from the iron railway bridge of today, that was easier to access from the town, and so to please the tourists, and make life easier for everyone, the Thai's renamed the river underneath the second bridge from the Mae Klong to Khwae Yai. Khwae Yai can be translated to large tributary, but with English pronunciation, the word has ended up as 'Kwai', which actually means buffalo in Thai. Despite the historical inaccuracies surrounding the bridge, the city itself has done a good job of presenting the history of this area in an unbiased and accurate way. 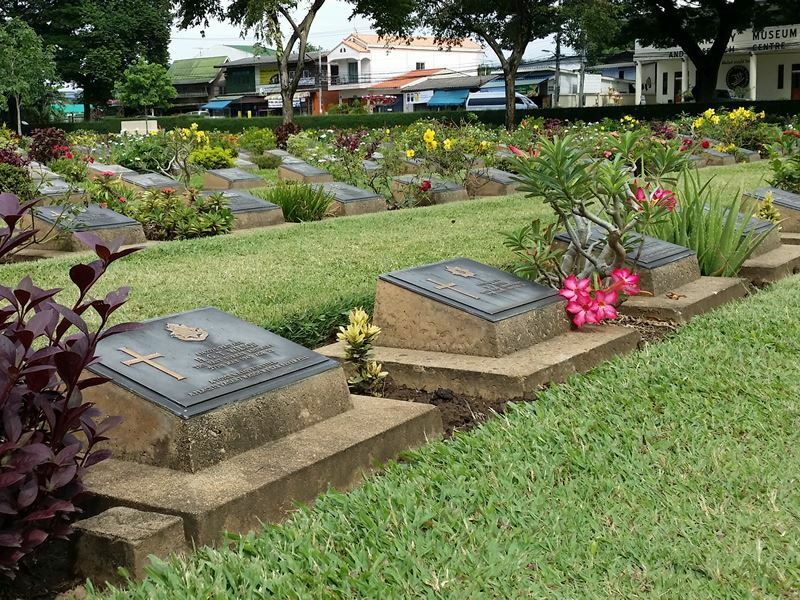 In the centre of Kanchanaburi town there is a simple memorial and a large, well maintained war cemetery. This is the main prisoners of war cemetery for victims of Japanese imprisonment during World War Two, with most of those held captive dying from malnutrition or disease. When walking around the 6,900 graves you will seem mostly Australian, British and Dutch names, as Americans who died here were repatriated. This is a sobering place, but one with a lot of history, and there is a steady amount of Japanese tourists who visit too. 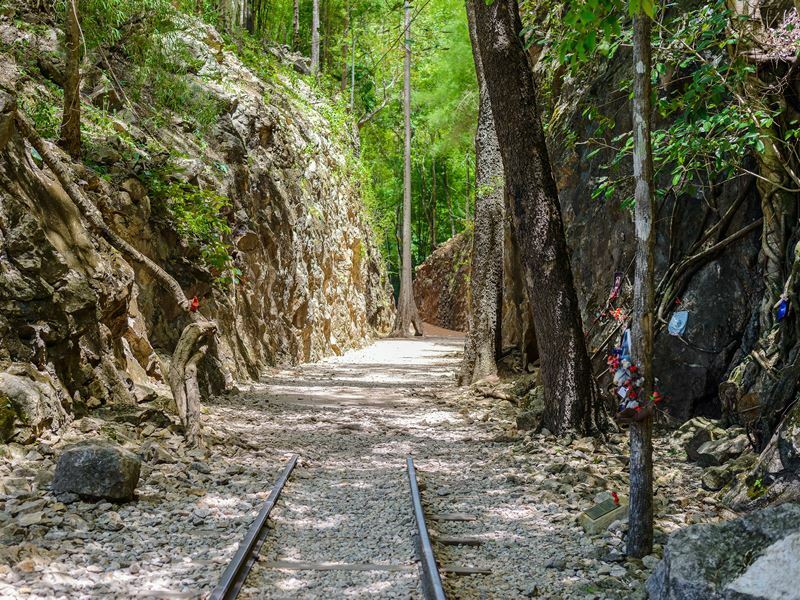 Across the road from the cemetery is the Thailand–Burma Railway Centre, an interactive and informative museum presenting a complete history of the Death Railway and Japanese occupation. The museum, founded in 2003, is privately funded by an Australian history expert of the region and is open daily from 9:00 – 17:00. Admission costs around 120 Baht for adults and 60 Baht for children. The museum takes about one hour to visit, offers air conditioning and should be combined with a visit to the cemetery to feel the full magnitude of what happened here. To complete the understanding of what happened most people take a train trip along the Death Railway to glimpse the jungle conditions prisoners would have lived and worked in. The Burma-Siam railway line originally planned to connect all the way to Yangon, which was a dangerous and near impossible route through mountainous jungle. During the Japanese occupation the line was built to the border, today termed the Three Pagoda Pass, but the trains running along the railway today don't make it all the way up there. 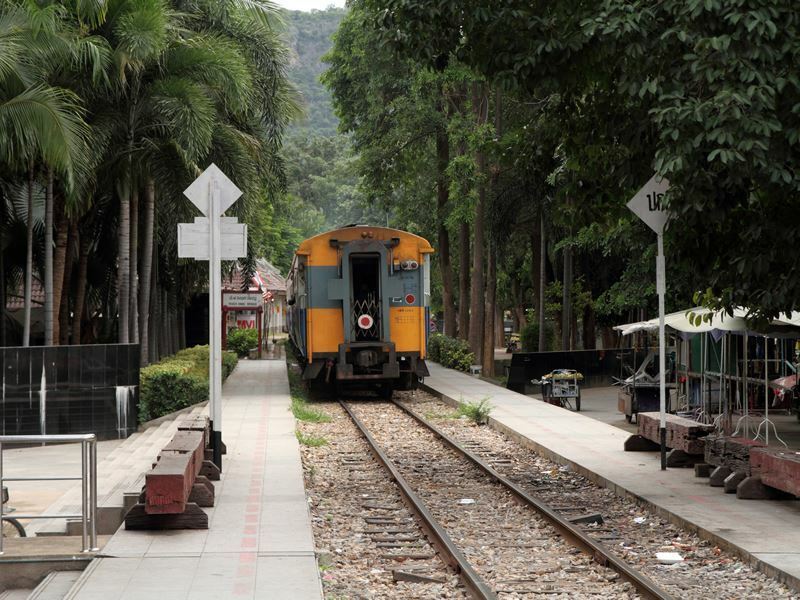 The current Death Railway journey terminates in Nam Tok, a small village two hours from Kanchanaburi town, and travellers on average spend 15 minutes before returning on the train back to their starting point. The journey on the train offers good views of the river Kwai and Mae Klong River, as well as Hellfire Pass in the Tenasserim mountain range. The mountains traditionally served as the border between pre-war Myanmar and Siam, but today all lay on the Thailand side. Taking a ride on the Death Railway is easy. You can catch the train from the station a little before the bridge itself, or from Kanchanaburi's main station, where window seats can be secured easier. The journey is long and there is no air conditioning on the train so it is wise to take water and a snack with. Visitors walking across the bridge need to stay aware of the train crossing, although you will see and hear it in advance. Visitors from Bangkok can take the train all the way from the capital to the end station, with the two trains joining up in Kanchanaburi. This is an interesting journey, although the Death Railway journey doesn't go as often as the train to Bangkok, so most people stop and visit the cemetery in between train times. The first stop on the rail journey proper, just over 50 km from Kanchanaburi town, is Tham Krasae Station, location of a wooden rail bridge that straddles the rock face, and Krasae Cave that houses a Buddha and is held to be a sacred place by locals. Hellfire Pass is the main attraction on the train journey as it was the most difficult part of the railway to construct. It involved rock cutting on a large scale and conditions at this part of the construction were claimed to be the worst, with many lives lost. Prisoners were likely not given proper equipment and landslides, rockfall, exhaustion, disease and guard violence led to many deaths in the Hellfire Pass. The train journey will show the general remoteness of this region, as there are few buildings along the long journey. ElephantsWorld also arranges day and overnight programs, so if you are short on time then you can combine meeting elephants with a trip into the province's history. 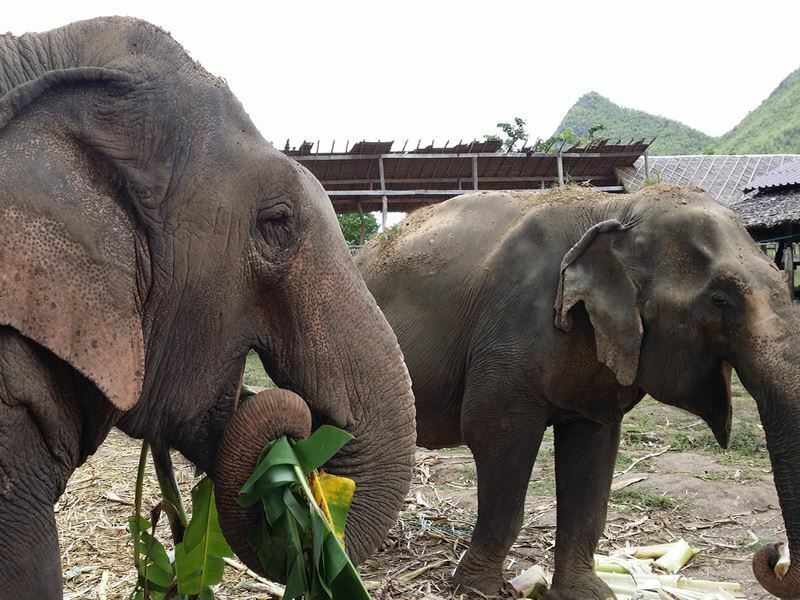 The elephants at the sanctuary are well cared for and seem to enjoy the company of people. 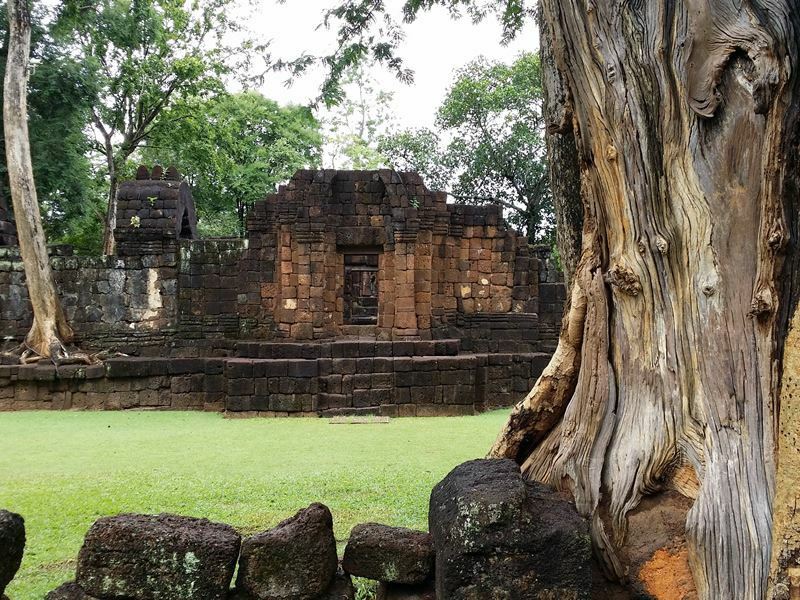 A short 20 minute drive from ElephantsWorld is Mueang Sing Historical Park, housing the remains of two Khmer temples from the 13th century. This is a beautiful spot, and rarely busy, so arguably a quieter place to study Khmer architecture compared to Angkor Wat. Erawan National Park is also around 50km out of the town, but well worth the visit. 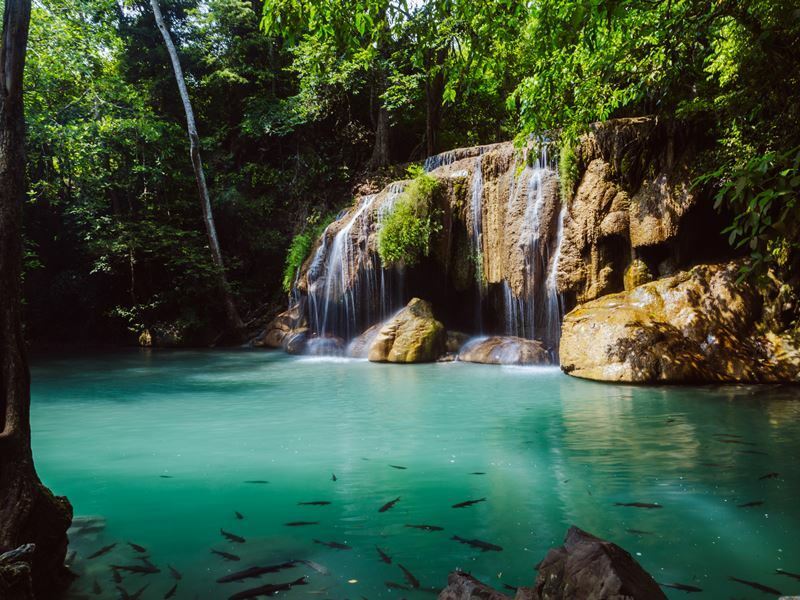 Erawan Falls is one of the most majestic waterfalls in Thailand, and has seven tiers and an aqua blue lake for swimming. There is a short and steep walk to get to the waterfall so taking good shoes, as well as a swimsuit and sun lotion is recommended. If you don't have time to travel to Erawan National Park, then near Kanchanaburi town are some fun jungle rafting experiences along the river. Information can be found about all these activities at most shops and restaurants in the town, as well as transport to them. Overall, Kanchanaburi is well worth a day trip from Bangkok, and offers a glimpse into a past that is still relevant today.